Belongs to the collection of two lamps which name refers to the name of the dwarf planet called Pluto. Its structure is changing while orbiting around the Sun and that fact become a source of inspiration for me to create two lamps. Pluto’s internal structure consists of dense core of rocks surrounded by a mantle of ice. Its orbit is elongated and when Pluto is closer to the Sun – the temperature increase causing the ices to sublimate into gas. 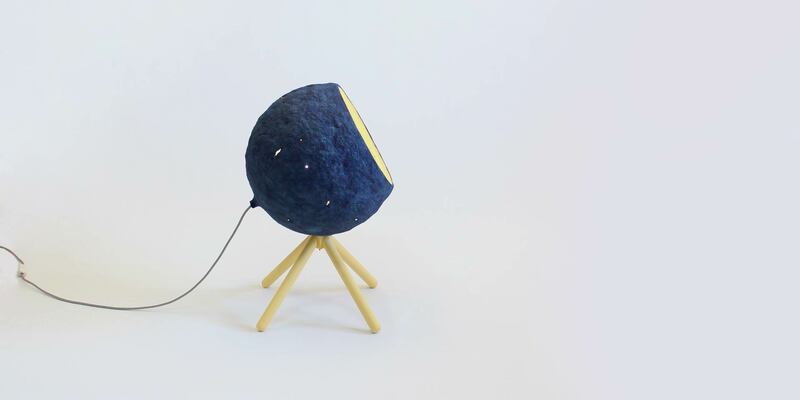 The second version of the same “Pluto” lamp is an effect of the reverse phenomenon. As Pluto moves away from the Sun, its atmosphere gradually freeze out, and fall to the ground. That’s why I create a floor lamp, with the thick, solid layer of paper, much heavier than in the first one. This version of lamp refers also with its form to the Disney cartoon character called Pluto the Pup – the dog of Mickey Mouse. This lamp is made from paper pulp obtained using only old newspapers and from wood. Supplied with black and white textile cable (2 m). Dimensions: 65 cm high x 43 cm wide. Handmade in Spain. On the photos with the pictures of Spanish painter Jesus Angel Bordetas.